If you regularly ride a bike, you know that people will say some weird stuff to you. Stuff they wouldn’t say if you were, say, walking. Or, let’s say, in a car. 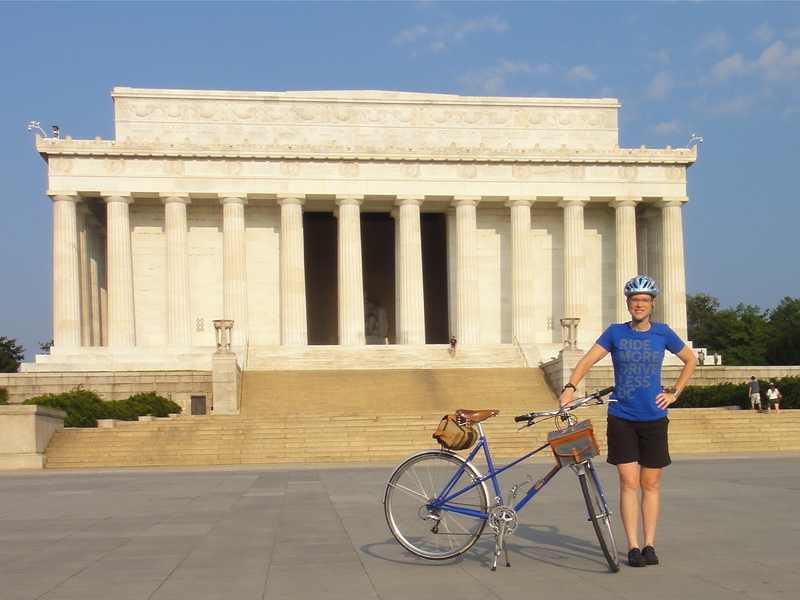 Velo Orange and me at the Lincoln. Ridin’ safe. Normally I don’t pay attention to these things, but because so many people said it to me, I got to wondering about it. Did I look like I might pick a fight with someone? Perhaps this week’s full moon made people worry about my safety? 2. Out of genuince concern. Most people know cyclists ride in the road (not the sidewalk, as some erroneously think they should) intermixed with cars and other traffic. Cyclists are more physically exposed than a person encased in a giant blanket of steel. We’re vulnerable on the road. I don’t mean to over think it, but I find it odd that people make these kinds of comments to me only when I’m riding a bike. Being a pedestrian in this town has its own travails, as does being a (God forbid) driver or a Metro passenger. Safety is not a cyclist-specific issue. The next time somebody says “Ride safe!” to me, instead of being tongue-tied or perplexed, I’m going to try to appreciate their concern, give them a smile, say “You too!” and ride off into the sunset. With my helmet on my handlebars head. Can’t wait to get out with Felkerino this weekend for a ride or two. Ride safe, all, and have a great weekend. I don’t give much thought to the “ride safe” exhortation. People tell me “drive safe” when I drive a car. One way to say goodbye (regardless of the mode of transportation used) in Japanese literally translates as “be careful,” but it really just means “see you soon”, as saying “goodbye” has connotations of never seeing someone again. So that’s how I take any wishes of being safe when I leave. See you soon! Once while riding Clifton Rd, having just turned from Maple Branch, I got off the phone with my dad, but was still mulling over the conversation. In my distractedness, I noticed a long pothole only as I was entering it. Instead of continuing and exiting the other side, I tried to move to the side, and promptly was thrown to the bloodly pavement. Lesson learned, I now wish riders and drivers safe ride/drive, with the hopes their minds don’t get mired in our conversation as mine did. I’m with Lisa. I’ve always said “drive safe” or “travel safe” or “fly safe” or “ride safe” or some variation of “transport safe” whenever someone is leaving. I don’t know why I’ve always said that – maybe a habit I picked up from my parents? Maybe it just seems a bit more jovial than “goodbye”? I tend to swap between “transport safe” and “have a good night”. I’m sure you don’t look like you’re about to pick a fight, I bet the majority of these people are just doing it reflexively (and I’m glad that they’ve noticed you’re on a bike – rather than instinctively telling you to “drive safe”!). Thanks to everybody for the perspectives, some of which I had not really considered. I’m glad to know I don’t look like I’m about to pick a fight :). I also tend to say “Ride safely” or “Drive safely” or “Drive friendly” or whatever. Maybe it’s the equivalent of “Bonne route” since it is too hard to say “Have a good ride” or “Hope the roads are nice”.